Two technologies invented by University of California, Riverside, researchers received National Innovation Awards at TechConnect’s annual convention in Anaheim. TechConnect is a global technology outreach organization dedicated to locating the world’s most promising intellectual property and startup companies across all industries and technology focus areas. The TechConnect World Innovation Conference and Expo connects top applied research and early stage innovations from universities, labs, and startups with industry end-users and prospectors. The TechConnect Innovation Awards, which took place in May, identify the top 15 percent of submitted technologies as ranked by the TechConnect Corporate & Investment Partner Committee, whose members come from many major corporations and venture capital firms. Innovations are submitted from global academic technology transfer offices, early stage companies, small business innovative research awardees, and government and corporate research laboratories. Winners are chosen based on the potential positive impact the technologies will have on their respective industries. TechConnect will track the commercialization efforts of the awardees, encourage continued funding, and assist in bringing these technologies to market. Alexander Balandin, a distinguished professor of electrical and computer engineering in the Marlan and Rosemary Bourns College of Engineering, incorporated the superior heat-conduction properties of graphene into thermal interface materials and thermal phase-change materials. Both of these help electronic devices dissipate the heat generated by their internal components and reduce overheating. As little as 1 percent of graphene in thermal interface materials successfully reduces processor temperatures by 10 degrees C. Graphene-enhanced phase-change materials also substantially reduce the temperature of lithium-ion battery packs, which are found in mobile phones and many other devices. Balandin’s invention is based on his research group’s discovery of unique heat conduction properties of graphene. The invention has other wide-ranging applications, including use in computers, medical and office equipment, electric vehicles, and energy production. The most recent results and technology were presented at TechConnect by Balandin and Fariborz Kargar, a postdoctoral researcher. Among the major companies showing interest were Intel, Raytheon, 3M, and BAE Electronic Systems. Arun Raju and Chan Park, researchers at UCR’s Center for Renewable Gas, a division of the Center for Environmental Research (CE-CERT), developed a steam hydrogasification system that uses high pressure and heat to break down plant waste, known as biomass, into renewable natural gas, which can then be converted into liquid fuel or electricity. 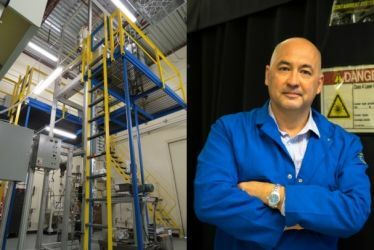 Joseph Norbeck, CE-CERT founding director, and Colin Hackett, manager of UC Riverside’s Alternative Fuels and Renewable Energy Research Program, also played key roles in the effort to develop the process. Conventional gasification involves subjecting the dried material to high temperatures without allowing it to burn by controlling the amount of oxygen or steam in order to reduce it to a gas. The new method allows wet biomass to be processed without an expensive drying step. The invention offers more efficient and cost-effective production of renewable natural gas converted from waste that could help reduce greenhouse gas emissions. Raju and Park are looking for partners to demonstrate the technology in pilot scale. In addition to receiving the two awards, UC Riverside faculty and staff were asked to participate in 13 panels and presentations at the convention. Representatives from the Office of Technology Partnerships connected with over 250 people and 30 companies to talk about research and partnership opportunities.